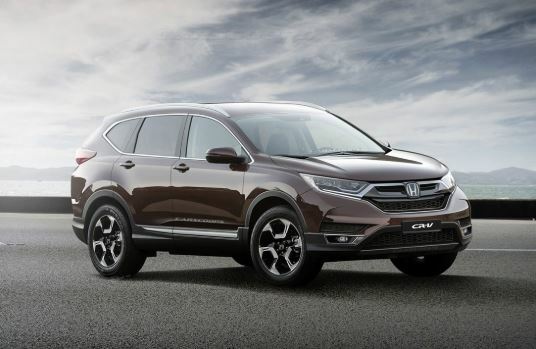 The new Honda CR V version 2017–2018 was presented by a Japanese automaker at a private event held in Detroit. The fifth generation of Honda CRV 2017–2018 restyling is a well thought-out continuation of the model line, which is the most popular among the models of this brand after the Civic. The most positive news is that the technical characteristics of the new version of the crossover will also be embodied by a high-torque turbo engine. What are the technical characteristics of the Honda CRV 2017- 2018 based? The new model Honda 2017/2018 of fifth-generation was presented at a private event to American journalists. The venue for the premiere of Honda CRV 2017–2018 was not without reason chosen, since the crossover is being successfully implemented in the American car market. At the same time Honda CRV 2017 has become larger than its predecessor, offering more space in the cabin. Also in the crossover during the restyling, the list of security technologies was expanded. Special attention should be paid to the 1.5-liter turbo engine from the above-mentioned donor platform with increased capacity to 190 horses. The automaker expects that the technical characteristics of the new Honda CRV 2017–2018 embodied in this engine will interest consumers, and this configuration of the Honda CRV 2017 will account for over 70% of all sales of this crossover. In the North American market, the fifth Honda CR-V is available with two petrol engines that interact with a continuously variable variator (on the turbo version, it is supplemented with a G-Shift switching algorithm) and rotating wheels of the front axle. For a fee, the car relies automatically start-wheel drive with a multi-plate clutch connecting the rear wheels. The new model has become even more perfect, getting the best performance in overclocking: instead of 9.5 seconds, 8.8 (all-wheel drive versions). The maximum speed increased to 194 km / h. Mixed consumption dropped to 8.3 liters (leader in its class). And although the Japanese crossover is far from sporty, hundreds of thousands of buyers a year prefer to buy it because of its economical engines. They talk about the development for the top versions of the new turbocharged 4-cylinder engine, issuing more power at low revs. There are also rumors about the development of a hybrid. The manufacturer only modestly explained that the line of units in different countries can be represented by different engines. The Japanese set a goal for themselves – to retreat from a conservative image, and they succeeded. The facade of the crossover draws attention with frowning headlights (optionally fully LED), a “hexagon” of the radiator grille and a faceted bumper, and its stern is decorated with compound lights that “crawl” onto the luggage door, and the “trunks” of the exhaust system located along the edges of the bumper. The interior of the new Honda CR-V 5 is good – the manufacturer has improved the quality of the finishing materials and has significantly modernized the interior design. Here, a completely new front panel and steering wheel, the instrument panel stands out with original graphics, and a 7.0-inch color touch display of a multimedia system supporting Apple CarPlay and Android Auto is located on the center console. Fans of this model will be pleased with the transmission selector, which has retained its usual location, which is placed on a special podium on the CR-V on a minivan on a special podium adjacent to the console, and not on the dashboard, plus a flat floor at the rear of the cabin. The front seats are also new, with many different adjustments and options. New security systems have also increased, which, however, are already becoming an integral attribute of many recent models. Adaptive cruise control, control of change of rows of movement, automatic braking system, prevention of frontal collisions and the recognition system of moving objects, which in this case are pedestrians, engine start button, USB ports for rear passengers. In 2017, the Honda CR-V was completely revised, suggesting a combination of practicality, economy and cost, making it one of the best selling crossovers in the last 20 years. « Prices for the new Hyundai Santa Fe 2018 start at $ 37,500. Is the Korean crossover worth the money?